For those readers who are living in America there will be an interesting documentary on PBS coming up on April 7th entitled The Buddha. Narrated by Richard Gere, who is himself a devout Buddhist, and shot by award winning filmmaker David Grubin The documentary will tell the tale of Buddha’s life. Featured will be the works of renowned artists who throughout the ages have been inspired by and have re-created the likeness of Buddha in many art forms. The documentary will also follow the history of Buddhism with added insights from contemporary Buddhists and the Dalai Lama. This looks to be a very interesting documentary and might serve to help gain some insight into Thai Buddhism and how it relates to the culture we love so much. For those not in America the whole documentary is already up on Youtube but you’ll have to figure out how to piece the many different videos into the correct order. The DVD can be purchased from PBS. For more information on this upcoming PBS Buddha documentary check out The Buddha on PBS. You can watch a preview below. Talen this would perhaps be just what I need but unfortunately as you know I live here in the UK and with my limited monthly internet usage contract, viewing lots of video is out of the question. I really would like to understand more about Buddhism. I have two books on Buddhism, Michael Carrithers Buddha and a teach yourself Buddhism book by Clive Erricker (the simpler of the two). Both are a little too complex for me. I just want something in plain English. Let me know how the series goes and maybe one day if it’s knowledgeable and easy to follow I can get a copy from somewhere. .-= Martyn´s last blog ..Under the Mango Tree – The Killing Fields =-. Martyn, Much like you I would love to understand Buddhism better. I have read a few books but it’s still hard to connect for me. I’ll definitely be watching so ‘ll let you know if it was worthwhile. Talen, the more I live here the more I find my interest in Buddhism growing. Working on my Thai Temple blog has helped me gain some more insight, but I will try and view some of the videos (subject to rubbish Internet speed). .-= Mike´s last blog ..Wat Phra Chettuphon Wimon Mangkhlaram Ratchaworamahawihan or Wat Pho Bangkok =-. Talen sorry forgot to add: where did you get the header photograph? Is it one of your? Only I am looking for something similar for Wat Thai temple as a blog header. Mike, I love the Wats too which has gotten me more interested in Buddhism. Their beauty and the peace and tranquility I feel when visiting a Wat has really drawn me in more. Mike, the tree, Buddha and words are from the PBS site and I overlayed that onto an image I had. I could probably work something up for me if you let me know what you want and the size needed…let me know. Everything I know about Buddhism I have learned through total immersion and after 21 years I still feel like a fish out of water. For many years I was comfortable with the concept of making merit and receiving a blessing when you gave food to the monks as they made their rounds through Pattaya in the wee hours of the morning. But now, my wife seems set on visiting every Wat in Thailand and I swear there are different rules/procedures everywhere we go. It looks like the documentary will cover the philosophy behind Buddhism and not the practical application of the religion. That is the part I have a problem with as I don’t want to do anything that would embarrass my wife and reinforce negative falang stereotypes. I guess I need a Thai Buddhism for dummies book. Morning Talen! Great post. I’ll download the YouTube videos this weekend. Thanks! I’ve had an interest in Buddha and how his followers have changed his original intentions over the years. Seems it’s human nature to add all sorts of rituals to even the simplest of ideas (just look at the trappings of the Catholic church). My latest book, Meditation Now or Never, is by the author of Buddhism Plain and Simple. I like simple. The Wats around Bangkok are beautiful like their northern counterparts, but the one’s I’ve seen down here are not tranquil or peaceful. So now there is even more to admire about the Thai countryside. I’ve started recording the hawkers, loud speakers, dogs barking, music blaring, people laughing and chattering in the Wats here. The last one I went to had an announcer broadcasted throughout the grounds at high volume. Remember the Wat buried in the fig trees? There was a carnival atmosphere at that one. It also had a lottery ticket seller on a three wheeled bike with a tinny horn, food vendors, and best of all, loud birds in the trees. All quite fun actually (and I came one number from winning the lottery this week). 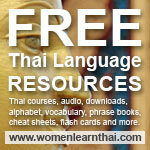 .-= Catherine´s last blog ..Top Thai Language Learning Forums =-. .-= expatudon08´s last blog ..call thailand and udon thani on the cheap =-. .-= Boonsong´s last blog ..Golden Tree Snake =-.